BEING A SUN LOVER, Wales has never been on my list of preferred travel destinations, and yet here I am, and it works. 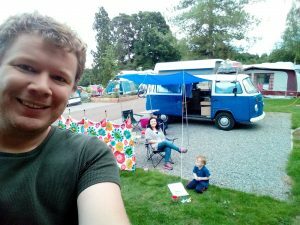 Our newly acquired campervan’s parked on a hilltop, a great expanse of sand stretching out to three Hobbit-like peaks beneath me, the too-tall shape of our shelter and rollicking wind causing a boiling kettle to shake in the summer breeze. The Gower is a rugged peninsula south west of Swansea; a largely unheralded corner of south Wales with a distinctly rural complexion, known for its beaches, walks and pub dinners. There’s a Famous Five-like innocence to the place. It’s the kind of happy middle-class escapism that pushed Enid Blyton’s characters into adventurous antics on rowing boats of dubious stability, the kind of place where you escape the tide in your swimsuit and then retire to a barbeque with an oversized hot chocolate. My wife, five-year-old son and I have decided to explore the area in an old VW, which we check in to the civilised but minimalist peaks of the Three Cliffs Bay campsite. It’s a spot that’s home to a mid-sized camp shop, lots of alluring footpaths, a view of the waves and the heady waft of burning campfires every evening. The beach is a short stroll down a hill, past timber-framed houses and onto an expanse of sand that varies between a small ledge and 500 metres of smooth, water-dappled space, depending on the state of the tide. There are the ruins of a castle, accessed by clambouring laboriously up a steep sand bank. There are views out over the Atlantic, and a long walk round the headland at low tide takes you to sea-view restaurants and more hilltop visages. Life drifts. Days involve lying in rock pools, trying to surf the gentle ripples that lap against the shoreline, or ad hoc games of football between two corners of the campsite, obstructed by dogs and ended with marshmallows melted vigorously over a fire. The Welsh language lives here in the way Irish does in the Gaeltachts: not quite dominant, but always lingering at the edges, the quick and distinct marker of a local. The visiting English speakers seem to soak up the lilt. It gently infected the fringes of their speech, as they take to walking the trails through tangled forests. Within a swift half hour stroll of Three Cliffs if the Gower Heritage Centre, where chickens roam about, Ariel the mermaid provides lively entertainment for the children, and plastic ducks race down a tiny stream to a still-functioning mill. It’s fronted by a cinema no bigger than a living room and a yoga venue, with cider served up in the courtyard to hardy folks in designer hiking gear.